A see through conversion kit allows a fireplace to be viewed from both sides of the wall it is installed into. 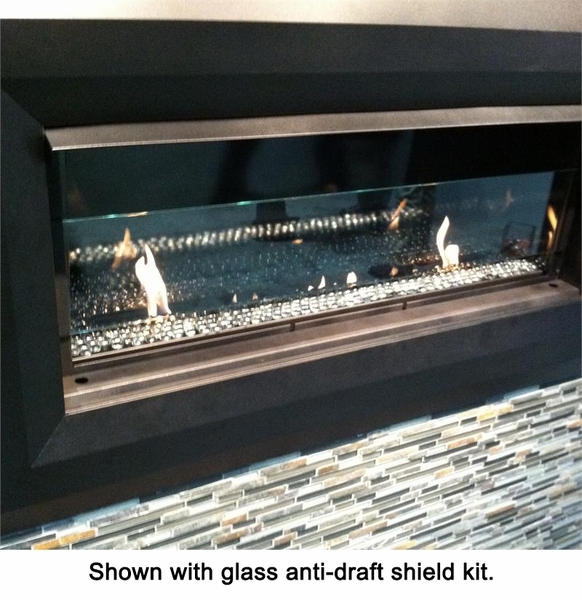 A draft shield is a decorative glass fender that helps to prevent flame buffeting from air movement in the room. It does not impede the view of the flame. *Also Note: This model is a direct replacement to the previously available FMI Paris Lights 43" Linear Vent-Free Fireplace LVF43NR. Making a beautiful installation even when not in use, the Superior 43" natural gas vent free fireplace features a bed of translucent embers that glow and sparkle from halogen lights beneath, creating a welcoming and soothing ambiance that perfectly fits the elegant flame jets. An optional adaptor kit (sold separately) transforms this fireplace from its factory-built single-sided configuration to a see-thru model that's perfect for any setting. All fireplace controls are concealed, too, meaning this beautiful fireplace is completely elegant in every situation. You may wish to also install this helpful optional accessory from the drop down menu: the LV43DS Linear Vent Free Draft Shield. The unit allows you to limit the amount of draft that the fireplace pulls by providing a buffer that securely attaches to the bottom of the fireplace opening. The shield is glass, so your view of the fire is not obscured. The shield kit includes all necessary hardware-the glass panel, screws, and brackets. Instructions are also included. Will this fireplace put off as much heat as a standard ventless gas fireplace? It will indeed. This unit can heat up to 1100 square feet. Can a noncombustible material be installed over the black part of the face without affecting the ability to service the fireplace in the future. I want to finish a one way fireplace similarly to the see through one in the product picture. Yes, noncombustible material can be used over the black face of this fireplace up to the opening, with room left for the access panel to service the unit. Can I use crushed glass instead of glass pebbles in this unit? No, this fireplace is only tested and listed for use with the clear glass pebbles. What are the framing dimensions? Can it be installed directly on the floor? Yes, this fireplace can be installed directly on the floor, and the bottom of the fireplace opening would be just over 7" from the bottom of the unit. The framing dimensions required for this model are as follows: 53.25" wide, 38" high and 17.5" deep. I have attached a diagram showing these framing dimensions as well. Do you have any other pictures of this? Can fake logs be installed in this vent free unit instead of glass beads? This model is not approved for use with an optional decorative log set and we currently do not carry any see-through vent free linear models that offer an optional decorative log set. What is the weight of this particular item? This fireplace weighs 275 lbs. Does this fireplace have a glass front? Vent free units do not have glass fronts, as this is how they obtain air needed for combustion. Can artificial driftwood logs rated for gas fireplaces be used with this fireplace? 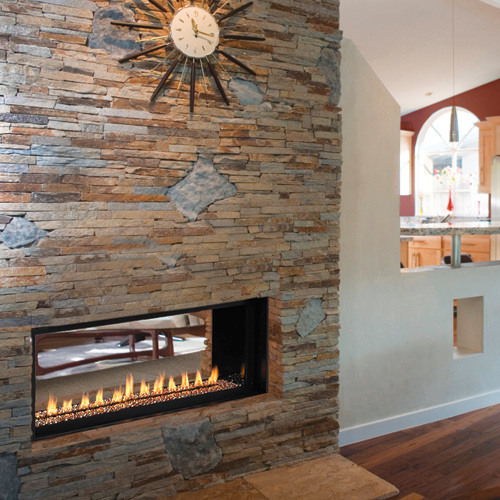 Only ventless gas log sets may be used with this fireplace. This is a gas unit that can utilize either natural gas or propane. Can this be converted to propane use? Unfortunately, no ventless systems may be converted. Are you aware of any retrofitting options that can actually add a vent to it to exhaust some of the heat? There are no retro-fitting options, but you could add a surface mount canopy hood or a mantel between the TV and opening of the fireplace to reduce the heat to your electronics. Would I be able to safely install this fireplace with drywall surrounding it entirely? You must install the included cement board at the top and sides of this fireplace as shown on page 8 of the installation manual. Can this unit be installed in an exterior Ramada? This unit is not approved for outdoor installation. Can you put as much glass as you want, as long as you do not cover the flame area? Correct. Glass media of any shape or thickness can be added to the media tray, as long as the burner area is not compromised. How high can the flames get? Maximum flame height on this model is approximately 6 inches. What is the height of the opening of this Superior 43" fireplace? The viewing area is 16 9/32" high. Is this Superior 43" linear fireplace listed with an independent testing agency? Is that what the PFS rating is? Yes, this unit is tested to PFS and NFI standards. Does this fireplace require air from the outside? Does this fireplace include a blower? What are the dimensions (43" W x ?H x ?D) for both the fireplace and outside trim? This unit does not require external combustion air, however it must be installed into a room that meets the volume requirements. These requirements are outlined in the manual. Because this is a smooth face model, it does not have provisions for a blower. The physical opening on this unit is 16 inches tall by 43 inches wide. The framing dimensions are 53 1/4 inches wide, 38 inches tall, and 15 1/4 inches deep. 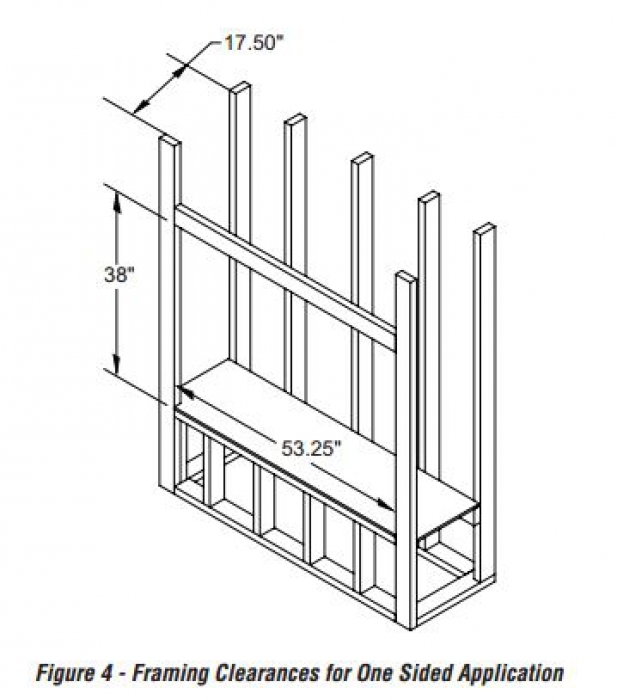 The optional decorative trims measure 58 5/8" wide x 30 9/16" tall x 1 1/8" deep. The box came well packaged and for the most part pretty simple basic install. Quality of the metal and painting is strong. While my guess is I just got one that had a very very very small leak in the installed gas lines. it created some extra work and stress to figure out. It appeared to be a clear mistake and poor quality control where a line had a small kink. ...a very small kink and very very small leak. My guess is it did not leak when they tested but with shipping it worked loose a bit. Anyway I would still for sure say YES to this product. Other... the remote has too many buttons on it for other models where this model needs a very simple on off for flame and light... with the vary levels... but again understand the universal remote. And finally while I have not adjusted yet or tried the out of the box flame variance from high to low is more minimal than you might wish for but again there for sure is a difference and maybe it is just the way it is. Again I would buy the product again. This was my first install of this firebox and you learn and assume things that you don't know. Truth is if there was a better video or ratings/reviews or pics to see online before Purchase I would have had less assuming and more knowing. The fireplace arrived in a timely manner. It was packaged well and relatively easy to install. They anticipated every possible installation challenge with clear instructions. ProsIt heats two rooms (with conversion package) at one time and is visually stunning; you are able to look into the other room. Great price. We just had this fireplace installed in our new construction by our builder. It hasn't been connected yet to the gas lines so we greatly anticipate its ambiance. Up to this point, I can give a 5-star for the aesthetics and for the speed it was delivered. I will return to give my overall thoughts on the whole fireplace experience in a couple of months. Thanks. Have used this in several homes and clients love it!